Simon and I spend so much time at Whitley Bay we've actually had discussions about buying a house there. With the amazing redevelopment of the seafront it really is the place to be this Summer and the opening of Spanish City is the real cherry on top. After months and months of desperately trying to see through the gaps in the scaffolding to get a glimpse at what's been going on the wait is finally over and today Spanish City in Whitley Bay finally opens its doors to the public and I, along with everyone else in North Tyneside am beyond excited. Being forever nosy I managed to get into Spanish City before it opened to the public for a little look around and to discover what we can expect from inside the Dome, I don't know about you but I've spent quite a lot of time wondering exactly what is going to be inside the beautiful building and couldn't wait to get in for a look. 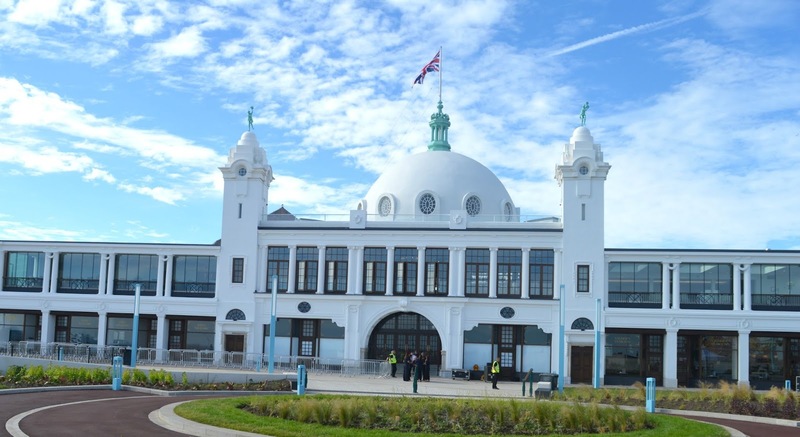 Spanish City has played a huge part in Whitley Bay's history, opening in 1910 as a concert hall it became a famous landmark on the seafront delighting residents and tourists with its restaurant, roof garden, tea room and, of course, its famous funfair. 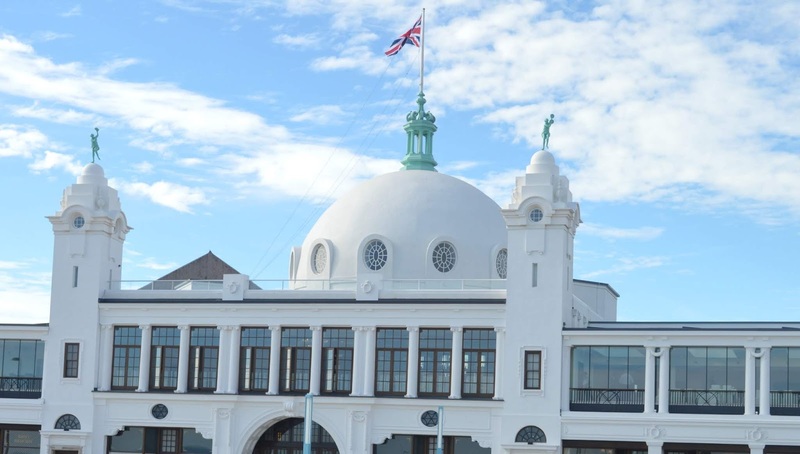 As with many British seasides, the visitors to Whitley Bay fell with the arrival of package holidays abroad and by the 1990s the once beautiful building had fallen into disrepair before it was finally closed to the public in the early 2000s. For over 15 years the once much loved building has been sitting deserted overlooking the sea, its glory days a distant memory. 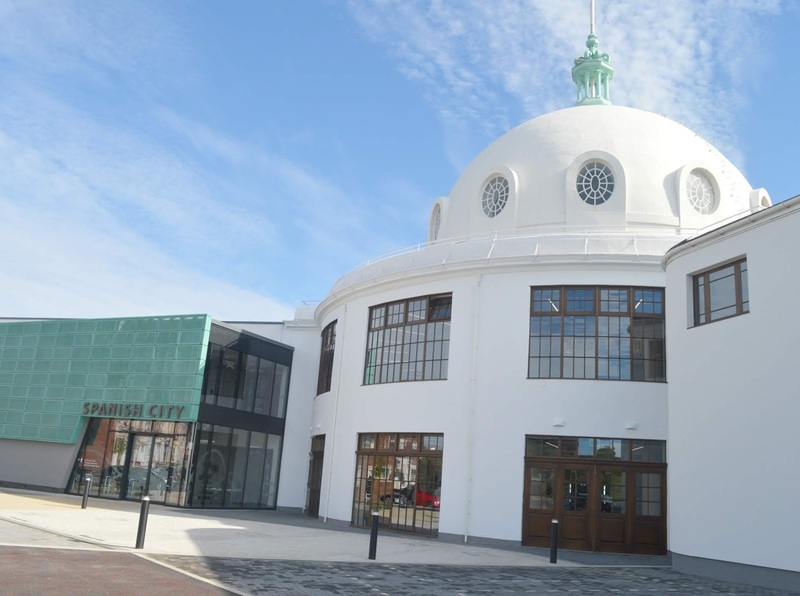 Led by North Tyneside Council and with help from the Heritage Lottery Fund, the redevelopment of Spanish City has cost £10 m and has taken years to complete. Restored with great care, the new Spanish City has been rebuilt to its 1910 design using historical images and drawings as a reference with many of its previously lost original features visible for the first time in decades. So now that the scaffolding has been taken down how is Spanish City looking? Approaching it for the first time I have to say it gave me goosebumps. Having never experienced Spanish City as anything other than a very sad looking abandoned building it felt amazing to see it looking so glorious on the sea front. The real jewel in Whitley Bay's crown, I was pretty overwhelmed looking at it properly for the first time, and I think the opening will be a very special moment that we'll all remember for a long time to come! Venturing into the building for the first time I wasn't prepared for how emotional I would feel. Spanish City is so incredibly important to so many residents and visitors to North Tyneside. 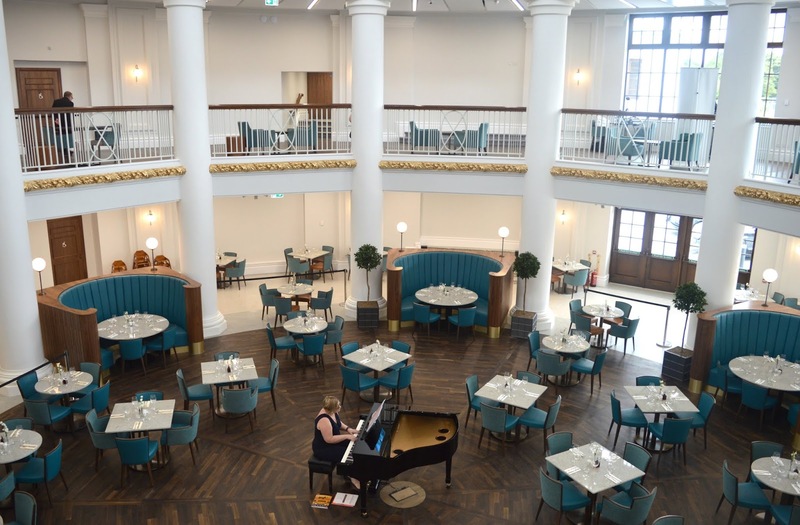 For many it holds special memories - meeting friends, falling in love and raising families - Spanish City played such an important role in the community and now in 2018, it's opened its doors once again to become the heart of Whitley Bay. It seems so incredibly sad to think that such an important building has been left to decay for so long and I think there will be a lot of very emotional people taking their first steps into the building this week, many probably thought the building would be lost forever! Having only moved to the North East five years ago it was my first time ever stepping foot inside and my jaw hit the floor! Every single person walking through the doors had the same reaction - "wow! It is stunning - beautifully finished with plenty of huge windows letting in loads of light and offering fantastic views across Whitley Bay. Spanish City will be used to host weddings, dances and events as well as being home to some rather lovely looking eateries! I can't wait to head back and try each one and am already wondering if I can justify doing a day-long Spanish City food crawl! 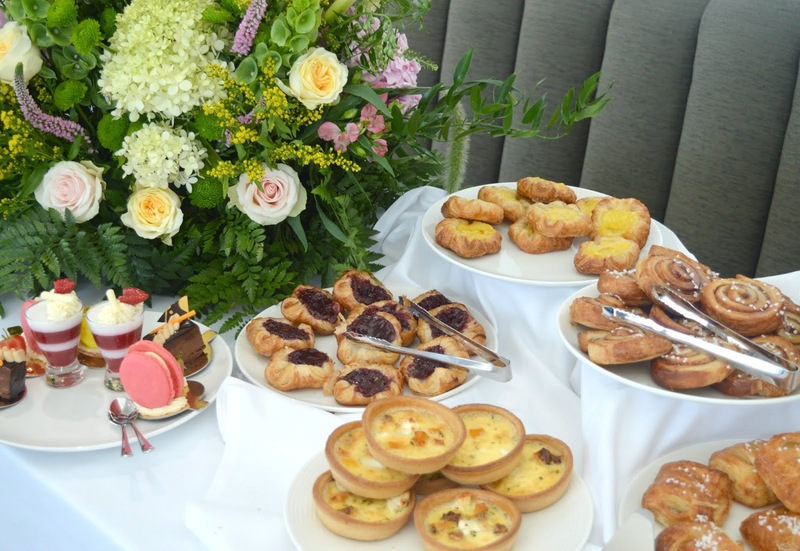 Fine dining with sea views, 1910 Steak & Seafood serve the very best food from the sea and land with creative dishes. 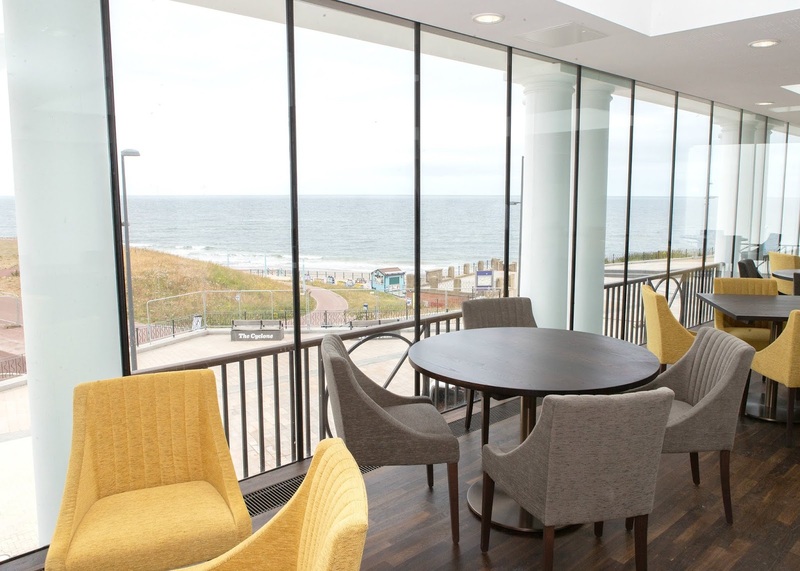 Each table offers a fantastic view across the sea and this is going to become one of the most beautiful places in the North East for date night! You can't visit the seaside without a British classic - fish and chips! Spanish City is home to famous Whitby restaurant Trenchers who have opened their first place outside North Yorkshire. Sitting under the dome it's my favourite space in Spanish City with fantastic views of the ceiling of the dome and some lovely booths for proper family occasions and, if the weather is too nice to sit inside, they also offer takeaway. 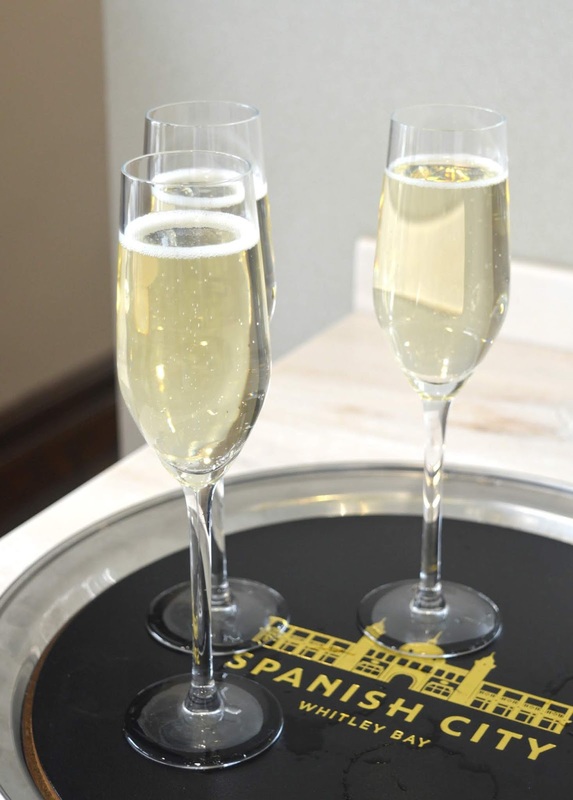 The perfect end to the perfect day, Spanish City's Champagne Bar is the place to go for a glass of fizz, beers, largers, wine and cocktails - with sea views and live music it sounds like the perfect place to spend an evening. My husband's personal favourite, Spanish City has its very own Waffle and Pancake House, perfect for an indulgent treat on the seafront. With a menu packed full of sundaes, waffles and crepes I can't wait to try! Unlike the other eateries it can't be accessed from inside Spanish City so it's a lovely spot to just wander into. Spanish City is now open and I can't wait to hear what you all think! You have no idea how buzzing I am about this. I just need to get into the habit of going to the seaside in proper clothes... and shoes!! So welcome! It's very exciting isn't it! We already spend a lot of time at Whitley Bay and I think we're about to spend even more!